Custom Socks that you can design with all over print images from your phone. 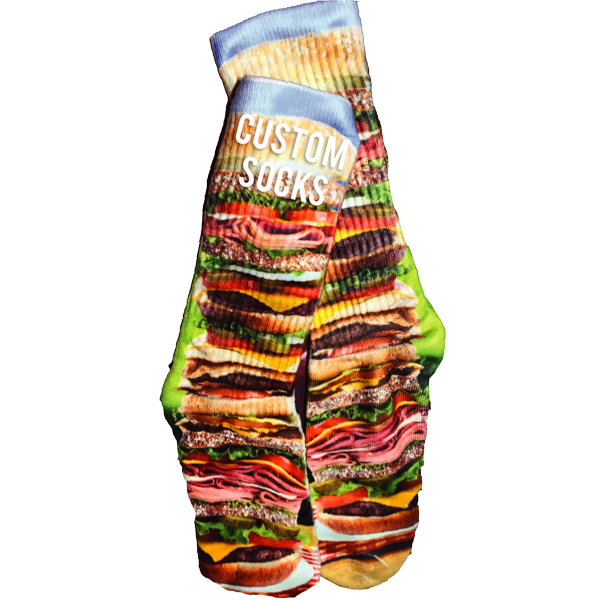 These 100% polyester socks are comfortable, breathable and can be wrapped in the image or graphics of your choice. We use a unique and tested print process to print the most vibrant images into the fabric of your socks. These ship in around 4-5 business days. Bulk pricing is available for events and managers. Our sample image here “The Burger Sock” was printed on site at our adidas activation in Las Vegas. Want to offer Live Design and Sock Printing at an event? Our teams have created custom retail activation printing socks in adidas flagship stores and in Finish Line stores in the USA. For live sock printing we allow guests to design the socks using the images available on their phone and customizing the items and we print them on location.